I'm new to dermarolling and the forum. I bought the .5mm and 1.5mm rollers, the copper peptide masks, vitamin C, tretinoin cream and infadolan ointment. Please, somebody, present me with a skincare regimen! I need to have an every day plan (will use .5mm roller) and a plan for "deep rolling" with the 1.5mm roller. How do I supplement with the tretinoin and Vitamin C? First of all, the more is not always the better. Do not overdo it, especially when you are still young. It also depends what you are trying to fix or achieve. Dermarolling frequency: Twice a week with a 0.5 and once every 3-4 weeks with a 1.5 mm derma roller. Vit.C remains in the skin for several days (it has about 4 days tissue half-life) so applying it twice or three times a week is sufficient. Do not apply it immediately after dermarolling with long needles. Vit. C (ascorbic acid) is acidic so it would sting. However if you roll with short needles for product penetration (0.5 mm or shorter) and can handle a little stinging, you can apply it right after dermarolling ( it will greatly enhance vit. C penetration), provided it doesn’t irritate your skin too much (add more water if it is irritating). Do a test patch first to find out how your skin reacts. Be careful on your face (add more water). Apply vit. C in the evening since it is sensitive to sunlight. Wash it off in the morning. Before rolling with a 1.5 mm dermaroller, apply vit. C for three consecutive days to achieve maximum concentration. After rolling with a 1.5 mm dermaroller, wait at least two days before restarting to apply vit. C.
A copper peptide mask can be applied after dermarolling, nevertheless some of our customers also experience stinging from the mask when applied right after rolling with a 1.5 mm dermaroller (some didn't experience stinging - neither did I) so they prefer to apply it on the days when they don't roll or apply it right after rolling with shorter needles or an hour later or so. You have to try. Do a test patch on a small area. Do not apply vit. C and copper peptides on the same day. Retin A ( Tretinoin= Retinoic acid) is also acidic. You should not apply it right after dermarolling. Application twice or three times a week is sufficient. (In some cases I do recommend applying it right after dermarolling - such as on individual stubborn stretch marks or scars). If you are young and you have no acne, pigmentation or scars, there is no reason to apply A-Ret on your skin. Apply it in the evening since it is sensitive to sunlight. Infadolan is a protective, regenerative ointment with vitamins. It should be applied immediately after rolling (apply just a little). Infadolan is for dermarolling after-care and it is in general not suitable to be used as an ordinary daily cream on the entire face because it is oily. However it is very useful to apply Infadoan daily just around your eyes, on the back of your hands and on your lips. "When I use a copper peptide mask, there is always some liquid left in the sachet. I close it with paper clips, put it in the fridge and use the remaining liquids later. The mask's plastic layer can be removed because it is originally intended for use on closed skin. On "open", dermarolled skin, occlusion won't be necessary for extra penetration. There is enough liquid in the mask to serve you multiple times. Cut off a piece of the mask with scissors and smear it all over your face or other area. Put the rest of the mask back. Close it with a paper clip, the next day or some days later cut another piece off the mask and smear it again on your area. If there are liquids left in the sachet use them as well. The mask has a high concentration of copper peptides". Monday: Infadolan around the eyes and your daily cream on the face in the morning. Vit. C in the evening. Tuesday: Infadolan around the eyes and your daily cream on the face in the morning, dermarolling with a 0.5 mm, copper peptides after dermarolling. Wednesday: Infadolan around the eye and your daily cream on the face in the morning. A-Ret in the evening. Thursday: Infadolan around the eyesand your daily cream on the face in the morning. Vit.C in the evening. Friday: Infadolan around the eyes and your daily cream on the face in the morning, dermarolling with a 0.5 mm, copper peptides after dermarolling. Saturday: Infadolan around the eyes and your daily cream on the face in the morning. A-Ret in the evening. Sunday: Infadolan around the eyes and your daily cream on the face in the morning. Vit.C in the evening. If you skin peels too much, reduce the frequency of vit. C, A-Ret and dermarolling and apply a heavier daily cream. Monday: Infadolan around the eyes and your daily cream on the face in the morning. In the evening: dermarolling with a 0.2 mm dermaroller, apply vit. C immediately after (if it is too irritating, add more water to your vit. C serum). Tuesday: Infadolan around the eyes and your daily cream on the face in the morning. Thursday: Infadolan around the eyes and your daily cream on the face in the morning. In the evening: dermarolling with a 0.2 mm dermaroller, apply vit. C immediately after . Friday: Infadolan around the eyes and your daily cream on the face in the morning. Sunday: Infadolan around the eyes and your daily cream on the face in the morning. In the evening: dermarolling with a 0.2 mm dermaroller, apply vit. C immediately after. Once in 3-4 weeks: Vit. C for three consecutive days, dermarolling with a 1.5 mm dermaroller, Infadolan right after dermarolling and a couple of days more (if it doesn’t make you break out). Sarah, you are amazing! Thanks so much for the personal attention and time you've taken to respond to my post. I look forward to using your products and learning a lot from your website! I am almost 38 years old, no acne/scarring but see fine lines and wrinkles around my eyes, between my eyes and the beginnings of nasolabial folds. I have taken pretty good care of my skin for most of my thirties, having been careless with the sun in my twenties (and I'm pretty fair) so I hope it's not too late! Again, thanks very much! I'm confused as to when I brush my face with a toothbrush and use a .25 roller? You do not have to brush the face. It is a way of exfoliation and a good pre-treatment prior to rolling for scars and especially stretch marks but rolling the face with a 0.25 mm dermaroller already exfoliates the skin very well. No need for brushing. You can use a 0.25 mm dermaroller every second day. Using it three times a week is totally sufficient. Instead of a 0.5 mm dermaroller in the routine above, use the 0.25 mm roller. You can also apply vit. C, wait half an hour for it to be absorbed and then you'll roll with a 0.25 mm and apply a cream of your choice to enhance its penetration. You do not have to use copper peptides and A-Ret and vit C and Infadolan. You can use some of it in combination with an anti aging cream or whatever cream you like. I wanted to show how you can combine our products but it doesn't mean you have to use all of them. As I said, young, acne-free facial skin does not need A-Ret. A-Ret should be used on stretch marks though, even when you are young. Thanks so much for clearing that up. and not using $100+ creams. I am also new at this forum and I want to start dermarolling my acne scars with 1.5 dermaroller. I've already bought dermaroller, dermastamp, vit C serum,Infadolan, A-Ret and Copper peptidy mask. Sometimes I have acne so I use 2.5% benzoyl peroxide morning and night. Can you tell me what regime I have to do, how long after 1.5 dermarolling I can not use benzoyl per.. When I can use Copper pep. mask, Retin A and all this things, like you wrote above . You should roll every 3-4 weeks with a 1.5 mm. A-Ret: Three times a week, in the evening. Do not apply it immediately after dermarolling and a day or two after. (If you get no results after dermarolling the scars for many months, you can start experimenting with applying the A-Ret immediately after dermarolling but apply it to the scars only. You can use a toothpick for that. Apply just a little. Do not smear it all over your face because it will sting). Vit. C: Twice or three times a week. Apply in the evening on the days when you do not apply A-Ret. Wash it off in the morning. Do not apply immediately after dermarolling with a 1.5 mm. Apply vit. C for three consecutive days just before dermarolling with a 1.5 mm roller/stamp to achieve maximum skin concentration. Copper peptides - you can apply them immediately after dermarollling. Just cut a piece off the mask and smear it on your face. Wait about 30 minutes for it to absorb and apply Infadolan on top of it. Seal the open mask sachet (with a paper clip or tape) and use it until it is empty. Infadolan - apply right after dermarolling with the 1.5 mm and for a couple of days more if it doesn't make you break out. Benzoyl peroxide - do not apply it for at least 1 day after dermarolling with the 1.5 mm. 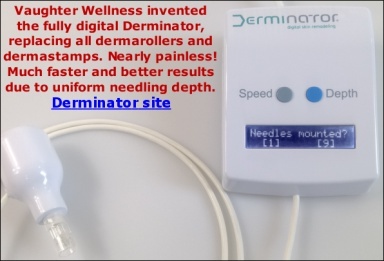 If you do not get results with dermarolling, consider needling the scars with our single needles. The combination of a 1.5 mm dermaroller with the single needles is successful in many stubborn cases. A small question, do you not put any cream on the face in the evening after vitamin C, maybe an hour later? Yes, you can apply any cream half an hour later or probably even sooner. Just let the vit. C absorb before you apply a cream. I am currently on a weight loss journey & after many years of yo-yo dieting & child bearing, I am successfully losing weight. Yay!! But I am becoming discouraged with the empty skin I am seeing when I look in the mirror. Instead of seeing inches lost, I only see deflated skin with stretchmarks that look like I was clawed by a tiger:( I'm starting to lose my motivation which is awful bc my health should be my priority but it just really gets me down. I have a personal trainer, I eat right, I weight train, I do yoga, I drink plenty of h2o, I dry brush my skin, & I use a "firming" OTC lotion but nothing is helping & I cant afford a body lift:( Would you recommend using microneedling for tightening stretched out skin? If so what length? How often? With what products? I am only 26yrs old however I have been overweight most of my life (I don't know if that will make a difference). Thank you for any advice. How many times can I re-use one copper peptide mask and how long I have to apply mask after rolling ?? If you keep the opened mask in the fridge you can use it until it is empty. Apply it every day or whatever frequency suits you until it is empty. I am following your suggested routine with .5 and 1.5 rollers. I apply copper peptide mask liquid after .5 and Infodolan after 1.5. I alternate Vit C and Retin-A on nonrolling nights. Somewhere in the posts I saw it mentioned that the copper peptide could be used after any size roller, so is it ok to use after 1.5 rolling? Thanks for all your help! If your skin can handle it, then yes. Try it on a small test patch first.